the surprise was a bit overwhelming last saturday, but it was not necessarily undeserved. 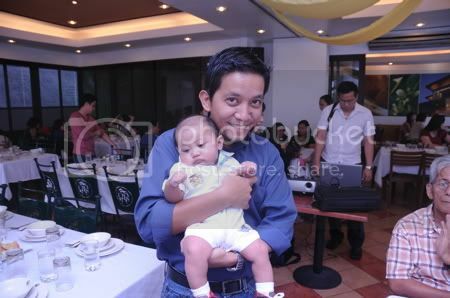 when i showed up at my nephew luigi's dedication at tiendesita's, my brother, sister-in-law, my brother's sister-in-law, and my parents expressed much joy that i found time from my busy schedule to play the part of ninong to the cute three-month old addition to our family. i have been guilty of prolonged absence, so much so that since luigi was born late november last year, this would only be the second instance that i've seen him. such is the consequence of having left my parents' house in QC to live by myself in makati city. and given the tendency of my brothers to visit the house unannounced, and my own tendency to be away on a weekend, we had very very few opportunities to actually see each other. so when my other nephew called me tito alvin, i wasn't shocked at all. i've lived my whole life with my family, and other than the five months that i spent in singapore in 1997, i've never actually been independent until september last year when i very gingerly moved out. i guess, despite not being able to eat too well, i'm enjoying the bachelorhood, which i've long imagined and thought about. now that it is happening, i'm enjoying the freedom, and even the loneliness of living alone. but i make it a point to always see my mom once a week, so she can tell me about her plants, her soaps, her pains. and i must schedule some time with my nephews. we've done timezone once. i'd like to go to ocean park with him one of these days. well it's only now that i have the chance to recall and surf and browse from the very first time i saw your profile, it has been months and i already forgot but since we are now in the era of high technology, i finally found it. Stalker? Nah? I just admire your achivements. It's me the virgin mountaineer and you're my living diary! Pero lately naging masungit ka.